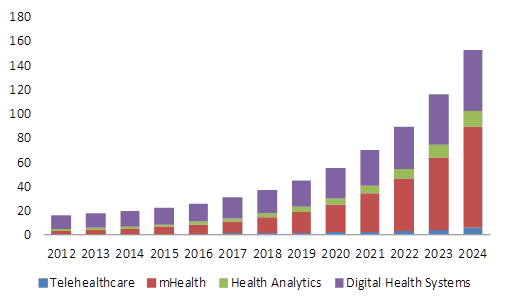 Industry trends suggest that through utilizing big data, the top opportunities for growth include cloud-based analytics, precision medicine and patient registries.4 For example, clinical analytics could help a practice determine the best treatment for patients based on their personal health data. This expands into improved prevention, diagnosis, and follow up care for patients’ conditions. Although there are many opportunities, worries over looming costs and operational gaps between providers and payers could prove to be very real challenges. Reports demonstrate that US healthcare providers and payers are adopting analytics at inconsistent rates. In some cases, healthcare systems are using basic reporting tools, whereas others are using the latest data processing systems for patient care. Additionally, this survey demonstrated that 72% of respondents cited clinical analytic interoperability as their largest problem. This was closely followed by difficulty collecting data (62%) and then time demands (60%). Like all advances in technology, disruption is an intrinsic part of development.6 Users will have to be trained to properly utilize the data, platforms and systems must be implemented in healthcare workplaces, and these tools must be user-friendly and work within a larger network of healthcare systems. Without these three factors, businesses and healthcare practices will be greatly challenged to implement the full potential and value of clinic data analytics. However, some systems like DermEngine (intelligent dermatology software) have recognized these obstacles and needs of physicians, patients, and administrators alike. Certain platforms have overcome these challenges through having the ability to integrate with clinics’ current EMR/PMS software (thus not disrupting previous patient data systems), as well as through providing valuable data. These platforms provide information about the number of patients, images, cases, and even types of diagnoses per clinic, individual, or group of doctors. In addition to being an excellent tool for performance evaluation, it can also be useful for analyzing the number of actions (diagnoses) by clinic location or doctor, as well as top diagnoses over time. 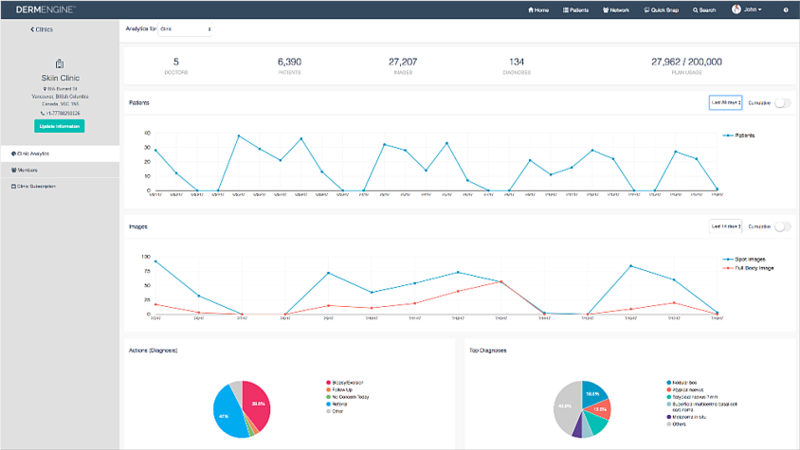 The platform’s performance tracking capabilities, access to real-time data, connected platform, and simplified data visualization serve as a centralized hub to enhance your business intelligence to improve the workflow behind prevention, diagnosis, treatment, and follow up care. This in turn increases the overall performance of the practice and utilizes the full potential that clinic data analytics has to offer. In conclusion, clinic analytics is a growing area of need for physicians, clinics and businesses alike. The potential insight gathered from the data provides an opportunity for pro-active business models that drive operations, rather than simply reflect. Before this can become a full reality, the technology will have to move past the initial stage of disruption and be widely implemented by professionals. Platforms like DermEngine are utilizing this movement to provide intelligent solutions that work intrinsically with other EMR software for a seamless experience. Once analytics platforms are more freely implemented, healthcare professionals will be able to extract valuable information from big data and find unique insight within the data to increase workflow efficiency and allow businesses and clinics to reach their maximum potential. Would you like to learn more about what DermEngine’s artificial intelligence (AI) dermatology software? Click the button below.